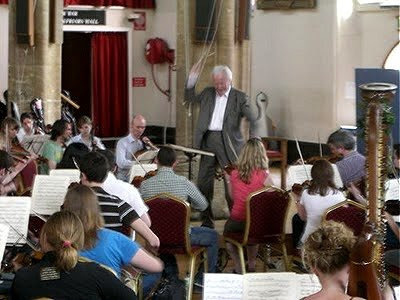 My photo shows Sir Colin Davis conducting the Chamber Orchestra Anglia in Elgar's First Symphony in an open work shop yesterday afternoon at the Norwich Festival. We talked to the 80 year old Sir Colin after he had topped two full length rehearsals with a full-on play through of the three last movements of the symphony. 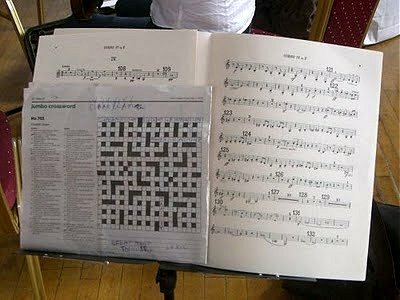 I commented to him that there weren't too many conductors of his status who would give up a day to rehearse a student orchestra. Back in a flash came his reply -'Oh you see, I don't worry about status'. More on Sir Colin and Elgar 1 here. I applaud Sir Colin for his attitude, but I wonder: how on earth does a chamber orchestra manage Elgar 1? Jeffrey, it was a very much augmented chamber orchestra for Elgar 1. If you look carefully at my header photo you will see some players who are a little older than the normal 25 years upper limit for the Chamber Orchestra Anglia. There were even two harps! Denis Wick (previous 1st Trombone LSO) put it this way. Playing symphony brass is like flying a Jumbo. Long periods of boredom with nothing to do, followed by a few minutes of terror when you land the plane.